Photo by Josh Naud Arthur Paszkowski beats the Trojans’ keeper to put the Cougars up 6-0, moments before the end of the first half. The Cougars went on to win 8-1, dominating the Trojans in the ACAC bronze medal game. The pursuit of gold came up a little short. 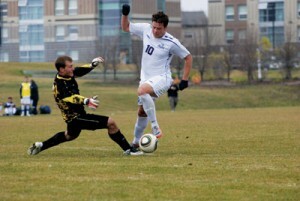 The Mount Royal Cougars men’s and women’s soccer teams, after tough losses in the ACAC semi-finals, both rebounded to capture provincial bronze medals. Playing in front of a small home crowd, the Cougars’ men’s team demolished SAIT 8-1 to capture the bronze, while the ladies defeated MacEwan 5-4 in penalty kicks in their third-place contest at Concordia. NAIT defeated Concordia 5-0 to capture gold on the men’s side while Concordia triumphed 5-3 in penalty kicks to grab the women’s title. The bronze medals closed out a season where both Cougars teams finished atop their respective divisions. The Cougars men finished with an 8-1-1 record and the women were a perfect 10-0. Individually, the Cougar men had seven players finish in the top 20 in south division scoring. Lance Forsyth finished first with 10 goals in 9 games, with Arthur Paszkowski netting 10 goals in 10 games. Also in the top-20 were Brandon Czymoch, Justin Tawtel, Mauricio Rosas, Joshua Doiron and Charlie Beaulieu. Among goaltenders, Tudor Dinca lead the way with a 4-0 record, three shutouts and a 0.25 goals against average. David Thalheimer finished third with a 4-1-1 record, two shut- outs and a 1.00 goals against average. Paszkowski, Forsyth, Colby Sawatzky and Justin Farenik were also named to the south division’s all-conference team. Head coach Jamie Pollock was co-winner of the south coach of the year. On the ladies’ side, the Cougars produced six top- 20 scorers, lead by Gillian Doubleday’s record-setting performance. Doubleday finished first in south division scoring with 20 goals, and was joined by Meghan MacDonald, Brittney Ahearn, Chelsey Ruckdashel, Janelle Carbert and Lesley Oosterhoff. Cougars goalkeeper Ainsley Cardoso-Wagner ended the regular season a perfect 8-0 with five shutouts and a 0.29 goals against average, while Kelsey Marklund was 2-0, with one shutout and a 1.50 goals against record. Doubleday, MacDonald and Ashley Dixon were also named conference all-stars.